Taste sensation! This really is the most delicious dinner I have ever eaten, and so quick to cook! How amazing are olives?!? The flavours go so beautifully with these summer vegetables, which is good, because they do contain helpful probiotics, as well as being utterly delicious. -put capsicum, onion and zucchini in a shallow baking dish. -Drizzle with olive oil and season with salt and pepper and roast for 10 minutes. Place flathead fillets on top of the vegetables, drizzle with a (little) more oil, and season with salt and pepper. 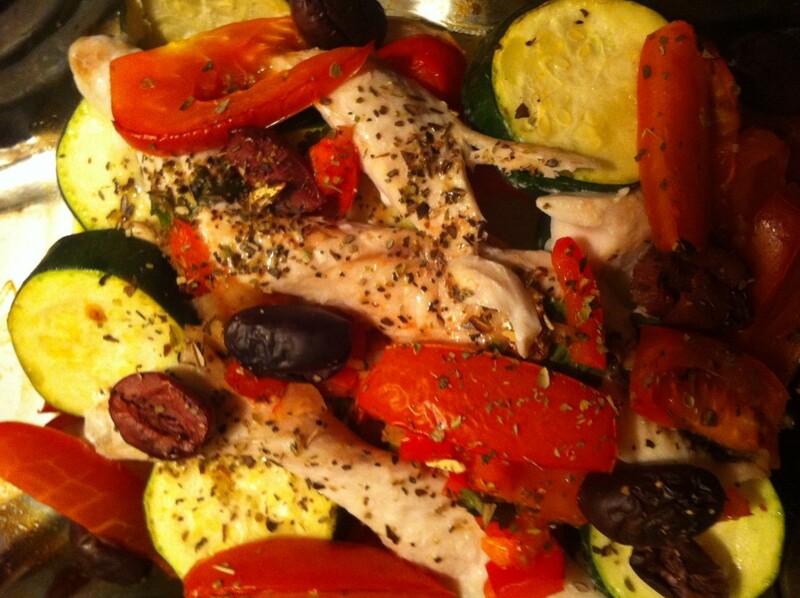 -Scatter tomatoes, olives and lemon zest around the fish. -Squeeze the lemon juice over the fish, and scatter with the herbs and bake for 8 – 10 minutes (or until the fish is a dense white colour).